Only the animal clipart images clearly marked for free use may be used for free and then only under the terms offered. All other use requires purchasing an image license or subscription. The animal clipart images and photos we offer for free are either licensed directly by us to allow such use or are confirmed by us to allow free use. Please do not frequent sites that post "free clipart" that they "believe" to be in the public domain. If you do so you are supporting copyright infringement and may end up being the one they sue. 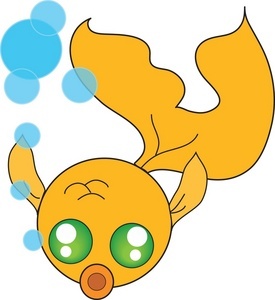 This low resolution, clipart image of a goldfish was drawn by Rosie Piter for Acclaim Images and may be used for free under the condition that you provide a link back to http://www.animalclipart.net/ or to the page on Acclaim Images. Any other use requires purchasing a license. This is a color clipart illustration of a goldfish swimming underwater as it blows bubbles. The image is only available in this small size as free clipart. You must purchase a license to use it in a larger size or if you choose not to provide a link back. This clipart picture is available in high resolution or in a vector eps format from Acclaim Images. Click on the goldfish image for more info. FREE KITTEN CLIP ART PHOTO This clipart photo of a cute kitten may be used for free under the condition that you provide a link back to http://www.animalclipart.net/ or to the page on Acclaim Images. Any other use is unauthorized. This is a photo of a very cute little kitten sitting with its paws tucked into its body. 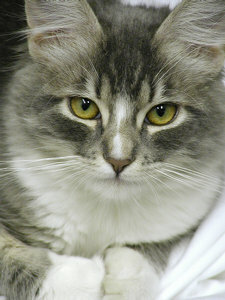 The cat is very young and is grey and white. This picture is available in high resolution as stock photography by purchasing a license from Acclaim Images. To do so simply click on the image. FREE PUPPY CLIP ART PICTURE This clipart photo of a cute pit bull puppy jumping up at the camera may be used for free under the condition that you provide a link back to http://www.animalclipart.net/ or to the page on Acclaim Images. Any other use is unauthorized. 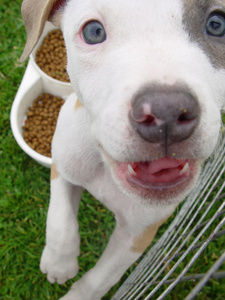 This is a photo of a cute pit bull puppy jumping up at the camera. The puppy is brown and white and its food bowl can be seen on the grass in the background. This picture of a pit bull puppy is available in high resolution as stock photography by purchasing a license from Acclaim Images. Click on the image to get more information.